Hi, I’m Pippy, and I'm a pointer. I live near to the Museum of the Broads and I love finding attractions that welcome dogs and their well-behaved families. It's such fun visiting dog friendly places in Norfolk. Firstly, a big paws for thought. Please don’t leave your dog in your car. It can get hot very quickly and because we wear fur coats, we can’t cope with the heat. Take us with you instead. ​Here are some ideas for days out with your dog. All have been trialled and tested by me, or by one of my canine friends. Enjoy! The 2018 Hallowe'en Trail has a canine theme! 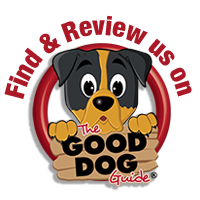 A dog and family friendly museum with activities for all ages. Dogs are also welcome on the steam boat, Falcon, and everywhere in the Museum. The Bure Valley Railway is a great day out for all the family where you’ll be able to take a nostalgic trip on a steam train on Norfolk’s longest narrow gauge railway. Dogs are welcome on the trains and the railway has their own resident Cocker Spaniel called Henry. Chosen by Kim, the Yorkshire Terrier. Bacton Woods for dog walks near to the North Walsham and Dilham Canal. There are trails through the forest for walkers and bike riders, and even a swing for humans to enjoy. ​Chosen by Prince, the Border Collie. ​Whether you want to hire your own boat or just take in the sights on a guided tour, Broads Tours offers a great way to experience the diversity of the Norfolk Broads and take in the beautiful scenery. All boats allow dogs and the guided tours offer light refreshments, are wheelchair accessible, and have a fully licensed bar on board. Chosen by Suki, the Westie. A garden centre, gift shop and superb tearoom at Moulton St Mary, near to Acle. Dogs are welcome everywhere and their owners can buy anything from wedding hats, to shoes, specialist food, artisan gifts, plants and lunch. Chosen by Amber, the Spaniel. 130 acres of cultivated, wild and natural plantings, a haven for wildlife enthusiasts. Nearly 4 miles of woodland pathways to explore for humans of all ages and their dogs. Plenty of sniffs around the trees too! Chosen by Axel the Lab/Collie Cross.